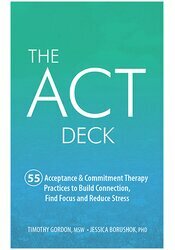 The ACT Deck offers 55 practices based on Acceptance and Commitment Therapy for use in therapy, classrooms or at home. These cards ask tough questions, encourage meaningful action and provide new perspectives to help you let go of negative thoughts and live in the present moment. Timothy Gordon, MSW, is a social worker and peer-reviewed international ACT trainer. He specializes in treating attachment and trauma related disorders. Tim is also a yoga teacher who integrates movement and yoga practices into his work. Jessica Borushok, PhD, is a psychologist specializing in health-related problems, including obesity, chronic pain, and coping with chronic medical conditions. In addition to clinical work, Jessica provides ACT trainings and program development internationally.